Most of Two Tap’s developers are either actively looking for or already using product feeds in their apps, on mobile and desktop. Semantics3 provide product feed data for over 35 million products and have amassed an impressive list of developers that are using their service since they started offering it. Some of them are actively looking for a solution to streamline ecommerce in their apps to increase affiliate revenue and provide convenience to shoppers worldwide. Our announcement today is centered around our Two Tap and Semantics3 working together to make developers lives easier. Two Tap API keys can be instantly released to any Semantics3 app developers directly in the dashboard. A new section is available under the Applications section that can release a Two Tap API key at the click of a button. A significant percentage of carts are lost due to customer input errors. This is true especially on devices that don’t have a full keyboard. 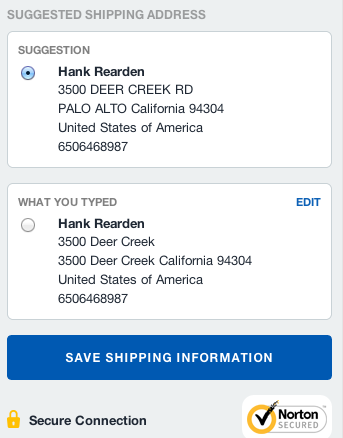 We’re all guilty of making a decision to buy something, going through the data input quickly for a checkout and then getting an error at the end. A significant amount of orders are lost in the process. We’re announcing the Two Tap Concierge service as an answer to this. It’s a simple evolution of our product that extends into direct customer service. At the end of any transaction, if there’s been difficulties in placing the order a customer can select to be contacted to fix the problem. Having the assurance of someone looking after your order is a step towards achieving convenient buying on any platform, in any context. Two Tap Concierge is an opt-in service available to customers using Two Tap Checkout and is available on a per order basis. 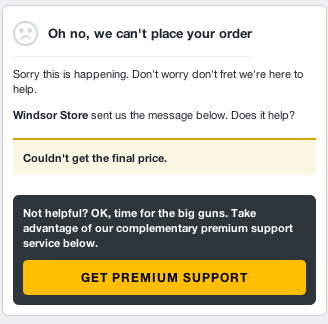 In typical fashion, premium support is requested with just two taps or clicks depending on the used platform. 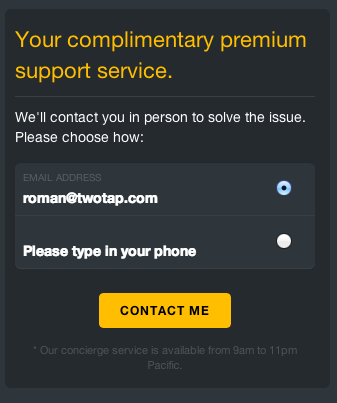 Two Tap Concierge now supports email and phone support and is available throughout the Two Tap publisher network immediately. Two Tap now validates all addresses that enter the system before attempting to place an order. In this random example Two Tap correctly identifies the city as being Palo Alto rather than “3500 Deer Creek” and suggests the change. *it incidentally makes some retailer customer address databases look very neat indeed. The new feature is now part of the Two Tap Checkout interface across all partners starting immediately. We’re happy to announce that TwoTap is teaming up with AirPair to give our customers a new way to connect with one another and join forces when working on the next generation ecommerce checkout solutions. AirPair gives developers instant access to the world’s best software engineering experts via online screensharing and video chat. There are lots of dev places that let non-engineers hire engineers one-off for projects, but AirPair is one of the few and the best that let developers connect with experts right at the moment they need help. To receive help and assist fellow developers, visit the TwoTap page on AirPair.